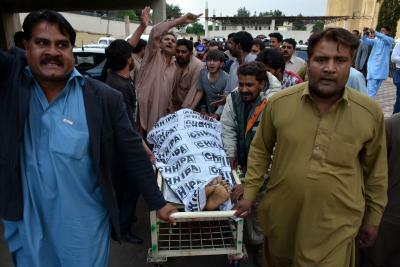 Islamabad April 16 (IANS) Bike-borne assailants killed at least two persons and injured five others outside a church in Pakistan s Quetta city police said. The wounded included two women. All injured were reported to be stable by the hospital Xinhua news agency reported. The assailants managed to flee the scene the police said. No group has yet claimed responsibility for the attack.